This is a really pleasant stroll on the perimeter of the Port of Carrara. We suggest that you combine it with a visit to the street market on Thursday as well as a walk around the streets of Marina Di Carrara. As there are mountain and sea views, it's best on days with decent visibility. In ancient times, Carrara marble was moved by boat under sail from Portus Mauricii on the left bank of the Magra river (now roughly at Fiumaretta). In modern times, it is handled in a large port which was purpose built. Fortunately, a walkway was included which allows pleasant views of the sea and the Alpi Apuane and the port activity. The ocean view is hindered by a large breakwater on the seaward side for about half the walk, but there's plenty to look at. Driving south along the statale SS432 from Sarzana or Ameglia (here called Viale C.Columbo) turn right on Via Aldo Salvetti and park the car. This right is at the end of a pine-filled park and there's a large bar named Johnnie Fox's (under renovation 10/2010) on the corner. If you see ships and port activity, you've gone too far. If you arrive by autostrada, turn right from the exit, and this will lead you to the statale in about 1km where you turn left along Viale Columbo to reach Via Salvetti. The walk begins inconspicuously on the left at the end of Via Salvetti, as you can see in the photo. The walkway then turns to lead straight out seaward and then turns left along the harbor. It is about 2.5 km round trip. At the beginning there's a good local fish market (open every morning and afternoons until the fish are gone) and a playground, but quickly the sea dominates the walk. This photo shows the free beach with the Caprione Promontory (Ameglia, Montemarcello) in the background. Once the walkway reaches the seaward arm, the views include the Alpi Apuane - the Marble Mountains - in the background, with the Port in the fore. The walkway ends at the port entrance where fishermen and pleasure boats often gather. When you're done, the Thursday street market can be found inland a few blocks and to the right (south). There are two good trucks selling roast meats, two good fish purveyors, as well as many vegetable sellers and the usual amazing and questionable fashions. See the map pin 5 for reference. You'll also find a lively neighborhood of local shops if you head toward the Piazza Menconi. The stores include bread, fish, alimentari, and a gastonomia. The unassuming gastronomia is worth noting. 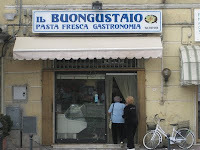 Il Buongustaio at Piazza Menconi, 4, has prepared foods as well as different sauces and fresh pasta (closed Monday). The selection is best about 90 minutes before meal time, and the food is good! Most of the shops are on the north side of Viale 20 Settembre and the streets near it. See the map pin 6 for reference. The harbor walk also combines with the nearby Viale Amerigo Vespucci to create a pleasant evening passeggiata. We happened on the area in late October when sunset coincided with the evening stroll around 6-7 pm. Crowds of retirees and lively young families made an especially enjoyable twilight. We don't yet have a restaurant suggestion for you within walking distance, but we'd welcome yours. However, a short drive away, the Trattoria Gloria is a great place to go for a real Italian experience. It is a lively place full of marble industry memorabilia, and very popular at lunch. The menu changes daily and is presented verbally in Italian. We can attest that the Insalata di Polpi, the Seafood Risotto, and the Seppie con Patate are good, and our bill for those three plus water and wine was 24 Euro! 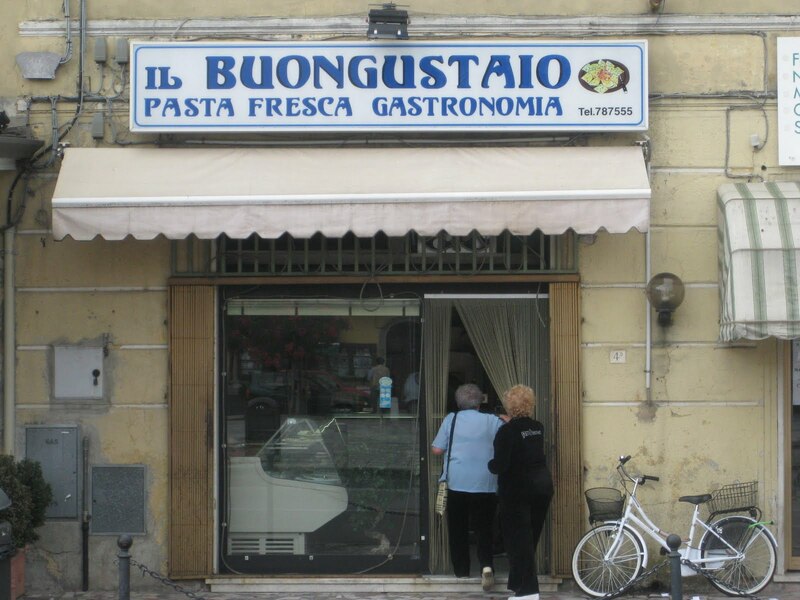 (11/2010) It's listed in Slow Food's Osterie d'Italia as it deserves to be, (Via Covetta, 92. tel. 0585 53876 closed Sundays and holidays. Via Corvetta runs parallel to the autostrada on the Alpi side. ).